Dec. 12, 2017 2:30 p.m. 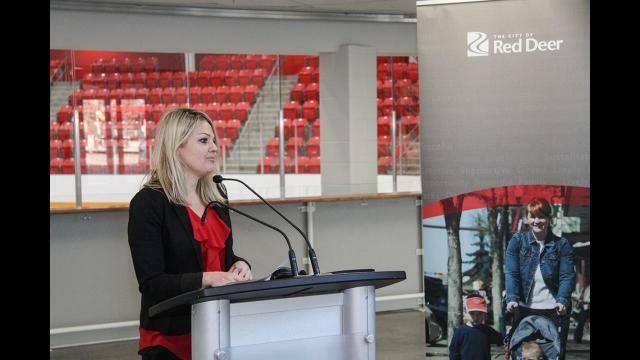 The City of Red Deer and Servus Credit Union recently held a press conference to begin the final steps towards the Jan. 13th opening of the Servus Credit Union Arena. During the announcement, Servus Credit Union President and CEO Garth Warner and Red Deer Mayor Tara Veer announced that Servus will provide a contribution of $1,000,000 over the course of 15 years. This sponsorship not only gives Servus the naming rights to the former Red Deer Arena, it will also go towards a free community skate night running the first Thursday of every month from 6:30 p.m. to 8 p.m.
“We have a lot of members who live in Red Deer, so being able to invest in the community where members live and work is very important,” Warner said. Veer said Servus’s contributions were important to create a modern facility during tough economic times. “The City recognized that for us to do more in these challenging economic times, we needed to engage in sponsorships and naming rights,” she said. Veer added it was important for the City to create a facility that respected the 64 years of history of the former Red Deer Arena. “It had 64 years of a proud history on many fronts, so it was important we incorporate as many heritage elements as possible,” she said. She added that the arena will be an integral piece of the 2019 Canada Winter Games. “Over the course of the 2019 Canada Winter Games, men’s and women’s hockey will be in this facility. In the lead up to that, it will be the home to local figure skaters, ringette players as well as hockey players,” she said. Veer invited Red Deerians to come experience the building for themselves in the New Year. “We are welcoming the public to our official opening on January 13th. The building is nearly complete, the finishing touches are just underway now and it will be ready when we welcome our community,” she said. Warner added that investing in Alberta is important to Servus Credit Union. “We have no other place to invest other than in our communities; we are local and we are only in the Province of Alberta,” he said.